Each week J. Kenji Lopez-Alt will drop by with a list of tools or a tool you might want to stock your kitchen with—if you haven't already. Kenji also writes The Food Lab column here on SE. You can fan The Food Lab on Facebook for play-by-plays on his future kitchen tests and recipe experiments.—The Mgmt. Having just adopted a French bulldog named Dumpling, I'm quickly finding out that taking care of a puppy is very similar to taking care of a good cast iron pan, and in some ways, almost as satisfying. They both require a little work, a little patience, and a whole lot of loyalty. The main difference is that in return for my investment, my cast iron pan gives me golden-brown fried chicken, sizzling bacon, corn bread, apple pies, charred hash, perfectly seared steaks, bubbly pizzas, and, yes, crisp dumplings. Dumpling the puppy, on the other hand, gives me mostly licks, chews, and a whole lot of poop. You do the math. As far as retaining heat goes, nothing beats a good, thick cast iron pan. Its density means that it takes a long time to heat up—I give mine a good 5 to 7 minutes on the fire—and doesn't cool down very much when you add food to it. So while a thin aluminum pan may drop by as much as 300°F when you add a half-pound rib eye steak to it, a cast iron pan will stick close to its original temperature, delivering a thicker, crisper, more evenly browned crust. Similarly, you can get away with using a little less oil when frying your chicken, since the heat retained by the metal will rapidly reheat the oil as soon as the chicken cools it down. The fact that its oven-safe means that you can braise and bake in it just as well as you can fry or sear. Cornbread comes out with a beautiful golden-brown crust, and pies come out wonderfully crisp on the bottom, even with moist fillings. It's heat retention abilities means that even when your oven's temperature fluctuates up and down (as most thermostat-driven ovens do), your pan's heat will stay fairly constant. And talk about durability! Cast iron cookware is one of the few items in your kitchen that actually gets better the older it is. The very best pans have been passed down sometimes over multiple generations, their well-used surfaces worn as smooth and nonstick as a Teflon-coated pan, without the toxic chemicals. Cast from a mold in a single piece of metal, there are no welded joints or even rivets to wear out. Modern cast iron is bumpy like this because it's been cast in a sand-based mold as opposed to the solid molds old cast iron were cast in. Some people claim and that it's not possible to season these bumpy pans properly. I don't buy it. I have compared my shiny, totally smooth 1930s Griswold (acquired at a flea market) to my 10-year-old Lodge skillet (which I bought new and seasoned myself). The old stuff is certainly more non-stick, but the new Lodge pan is pretty darn close, and good enough for most needs. So the key is all in seasoning it properly. How does it work? Well, if you look at a cast iron pan under a microscope, you'll see all kinds of tiny little pores, cracks, and irregularities in the surface. * When food cooks, it can seep into these cracks, causing it to stick. Not only that, but proteins can actually form chemical bonds with the metal as it comes into contact with it. Ever have a piece of fish tear in half as you cook it because it seems like it's actually bonded with the pan? That's because it has. To prevent both of these things from happening, you need to fill in the little pores, as well as creating a protective layer above the bottom of the pan to prevent protein from coming into contact with it. Enter fat. When fat is heated in the presence of metal and oxygen, it polymerizes. Or, to put it more simply, it forms a solid, plasticlike substance that coats the pan. The more times oil is reheated in a pan, the thicker this coating gets, and the better the nonstick properties of the pan. Scrub your pan by pouring a half cup of kosher salt into it and rubbing it with a paper towel. This will scour out any dust and impurities that may have collected in it prior to use. Wash it thoroughly with hot, soapy water and dry it carefully. Until you've got a good layer of seasoning built up, avoid excessive use of soap or cooking acidic sauces, as both can make the process take longer. From left: scaling and rust. There are basically only two really bad things that can happen to your cast iron cookware—scaling and rust—and neither of them is that bad. The photo on the left shows a cast iron pan that has undergone scaling. This happens when you heat the pan too often without adding extra oil to it. Rather than coming off in microscopic bits like normal seasoning will, the layer of polymers sloughs off in large flakes. To reach this state, I stored my pan in the oven for a month's worth of heating cycles without reoiling the surface in between heating. It's easy to avoid this problem by regularly oiling the pan after each use and not overheating it (don't leave it in the oven during the cleaning cycle, for instance), but once it happens, there's no turning back—you'll have to reseason it from the start. The photo on the right is a spot of rust that appeared on a cast iron pan that was not seasoned well enough and was left to air-dry. Water came in contact with the iron, causing it to rust. Unless the entire pan has rusted (in which case, you'll have to reseason the whole thing), this one is not much to worry about. Rinse it out with water, dry it, heat it up, and rub it down with oil. After a few uses, the rusted spot should be perfectly well seasoned again. 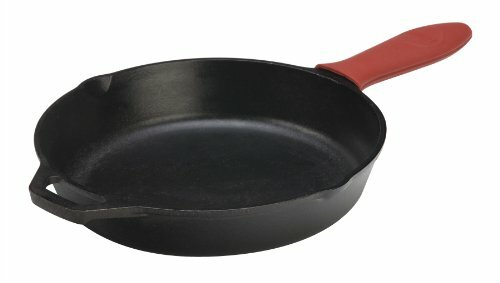 Which Pan Should I Buy? If you're lucky enough to come across a reasonably priced cast iron pan from the early 20th century at a yard sale or flea market (say, under $50 or so), scoop it up immediately. You can occasionally also find good deals on eBay and sites like it. I personally find it ridiculous to pay the $150-plus that some sellers are asking for old cast iron when a new cast iron pan, like the cast iron skillet from Lodge costs a mere $16.00 and will give you an equally lustrous nonstick surface with just a bit of time and care. * These are not to be confused with the bumps and dimples you can see on the surface with your naked eye, which have no effect on its nonstick properties.